March was a productive month in the Martin basement. I completed the necessary corner trackwork, finished installing my battery control for the turnouts, built a roll-away paint booth, got a wee bit of scenery done, and started filling an empty back corner on the layout with my mystery mill. and gives Jim an idea of what the final structure will look like on the layout. Some years back on The Model Railway Show podcast I co-hosted*, I had an enjoyable chat with Bob Walker. Bob’s Scratchbuilder’s Corner appears regularly in Railroad Model Craftsman. We both agreed there’s a special satisfaction in being able to build a structure for free, or almost nothing, using accumulated materials from past projects. So it is with Sumkynda Mill. 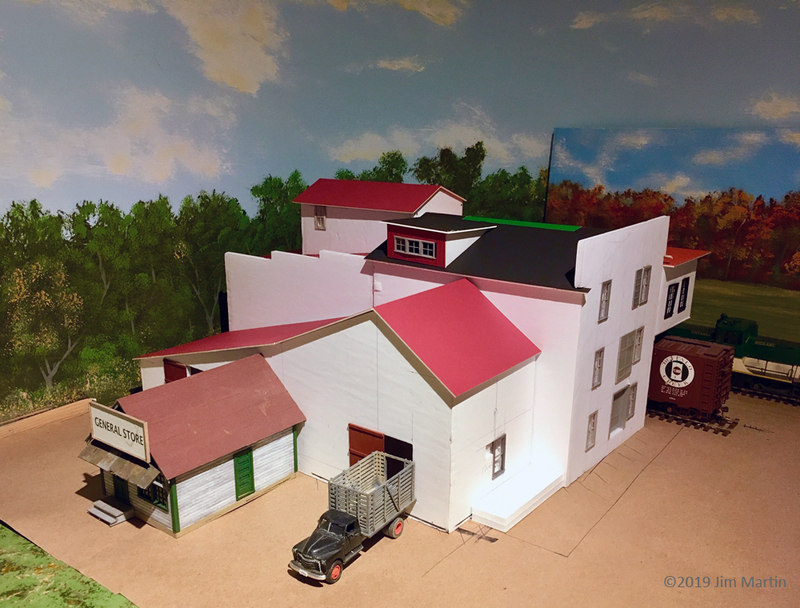 Sumkynda Mill is currently morphing from the mock up stage into something presenting a more finished appearance. This all began some months ago when a friend showed me the Danby Mill kit she had assembled for the HO layout she and her husband are building together. I was smitten by the look of the thing and decided I should have an S scale approximation for myself. The Danby Mill by American Model Builders was reviewed by Trevor in the June 2003 issue of RMC. That kit was inspired by the Hinkle Mill article in the January 1982 issue of RMC. Written by Mike Small and illustrated by Julian Cavalier, it begs to be modelled. Armed with both issues, I’m attempting my own take on the rambling, rustic structure. My total cost so far is just three dollars. That’s enough for two sheets of dollar store Foamcore for the basic structure shapes. Everything else is being sourced from various trays and boxes around the workshop. Odd assortments of Grandt Line doors and windows are the principal second ingredients. Old, rambling mills are great for using up various sizes of windows. Also tossed into the mix are parts from damaged plastic kits, industrial fittings from Ratio, Rusty Stumps warehouse doors, a variety of stacks, scraps of wood, matboard, styrene, and so on. The bits I’m finding will inform the final design while still paying tribute to Hinkle. I think Bob Walker would approve. Foam core is lightweight, fairly rigid and easy to work. I mortise the corners so no bare foam is exposed. Window and door openings are cut on the surface and the foam backing is gouged out. The bottom layer of paper remains. The cavity is painted flat black and once the glazed windows are installed the effect is sufficient. Foamcore board is inexpensive, lightweight, rigid and easy to work. I’ve used this stuff in the past for smaller mock ups but I’m not sure it’s the final answer for something this size. Before proceeding any further, I may construct new core shapes from heavy matboard. It wouldn’t be too difficult at this stage because I can easily copy the measurements from the foam core structure with my digital caliper. This will not be an exact copy of either Danby or Hinkle but so far I’m pleased with my efforts to capture the proportions and essential character of both mills. I would have liked a little more room on the layout to model the full width and depth of the complex but the most interesting shapes have been captured. I am adding a kit-built general store constructed and given to me by Pete Moffett. It will become the mill office. A quickly-applied coat of craft acrylics hides the white foam. These base colours will suffice until I get around to applying various textures of building papers. I will print those onto photographic paper from my Model Builders program. Having gotten this far, I will likely let this sit for several months before starting up again. Spring has arrived and I’m getting anxious to leave the basement and play with my outdoor toys. One last thing: Sumkynda Mill is a name that’s going to get old pretty fast. It’s simply a play on words while I figure what kind of mill it will be. Right now I’m leaning toward wood products. So the news of a major retirement in our industry has been floating out there for several weeks now. I had heard that Glenn Miner of Vitro was hanging them up back in January. It initially did not connect for me, after all Glenn is blessed with youthful looks and personality so I couldn’t even fathom retirement talk attached to him. It was true however, he told me himself and I had the obvious emotions. First and foremost I was so happy for Glenn and his family. Happy that he’ll get out of the industry and now do all of those things he’s wanted to do… next though was sadness because he is such a good man and such a major part of our world. Glenn is in my opinion one of the most well rounded folks in our world with regard to knowing so much about every product line that went into a building and understanding its value and place. No tunnel vision there at all. In addition to his great knowledge, Glenn’s desire to push for advanced education at all levels of our world is something that I hope gets carried on at Vitro (I am confident it will) but more than that- Glenn always made time to catch up with whomever crossed his path. For me personally, he always cleared some time to chat (though he would skillfully push off any of my video requests to the great Joann Funyak) and I will always be grateful. We as an industry will miss Glenn a ton and his impact will not be forgotten. Go enjoy the heck out of that next phase of life Mr. Miner- you have absolutely earned it! – As I noted last week, this week the industry had two events happening at the same time. I was at the Glass Processing and Automation Days (GPAD) in San Antonio and it was an excellent event. Ron Crowl and the awesome Fenetech team did everything first class and the education there was off the charts. The technology and innovation that is out there on the fabrication side is mind blowing to me. Over the course of GPAD- I saw so many pieces of machinery and software that fundamentally would change the way we all work… very exciting stuff. – In addition to the education side of it, the networking was top notch and a great chance to catch up with some of the great technical and business minds in our industry. Plus because of the operational nature of it I met a ton of new people from across our world. That was really cool expansion of the network! It really was like a BEC for the fabricator and it’s a conference I don’t plan on ever missing again. – First it was great to spend some time in San Antonio before the GPAD Conference kicked off. Getting to visit with my old friends, the Luna’s of Champion Glass was awesome. I am such a huge fan of David, Ray, Joe, and Davey Luna- they are just awesome people and I am honored to be a friend. Class acts and great for our industry. In addition I got to see some old friends I had not seen in forever- David Shaw and Rod Pistokcha of Complete Line Glass. Both guys are simply tremendous and their hospitality towards me and the team from NGA in town for the event was nothing short of spectacular. It was great to catch up with them both and I was very impressed what they are doing with the Complete Line plant and brand. – Third… Texas Tech! Congrats to the fans of the Red Raiders… my pal David Shaw (mentioned above) and especially Bowie Neumayer of Cardinal. He is a gigantic fan and no doubt will be floating all week until the Final Four begins Saturday! Tough one here… it does violate the rules but he did save a cats life. Click the link https://youtu.be/cO_pKjui0p0 if you want to see… blogger is not being nice to me today and allowing me to embed! Deep reinforcement learning (RL) techniques can be used to learn policies for complex tasks from visual inputs, and have been applied with great success to classic Atari 2600 games. Recent work in this field has shown that it is possible to get super-human performance in many of them, even in challenging exploration regimes such as that exhibited by Montezuma’s Revenge. However, one of the limitations of many state-of-the-art approaches is that they require a very large number of interactions with the game environment, often much larger than what people would need to learn to play well. One plausible hypothesis explaining why people learn these tasks so much more efficiently is that they are able to predict the effect of their own actions, and thus implicitly learn a model of which action sequences will lead to desirable outcomes. This general idea—building a so-called model of the game and using it to learn a good policy for selecting actions—is the main premise of model-based reinforcement learning (MBRL). 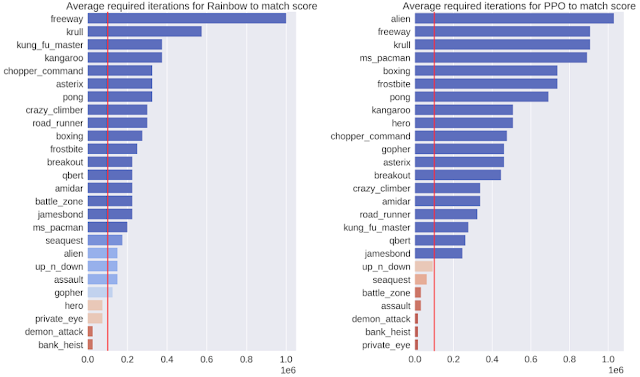 In “Model-Based Reinforcement Learning for Atari“, we introduce the Simulated Policy Learning (SimPLe) algorithm, an MBRL framework to train agents for Atari gameplay that is significantly more efficient than current state-of-the-art techniques, and shows competitive results using only ~100K interactions with the game environment (equivalent to roughly two hours of real-time play by a person). In addition, we have open sourced our code as part of the tensor2tensor open source library. The release contains a pretrained world model that can be run with a simple command line and that can be played using an Atari-like interface. To train an Atari game playing model we first need to generate plausible versions of the future in pixel space. In other words, we seek to predict what the next frame will look like, by taking as input a sequence of already observed frames and the commands given to the game, such as “left”, “right”, etc. One of the important reasons for training a world model in observation space is that it is, in effect, a form of self-supervision, where the observations—pixels, in our case—form a dense and rich supervision signal. One example of an issue arising from stochasticity is seen when the SimPLe model is applied to Kung Fu Master. In the animation, the left is the output of the model, the middle is the groundtruth, and the right panel is the pixel-wise difference between the two. Here the model’s predictions deviate from the real game by spawning a different number of opponents. The number of interactions needed by the respective model-free algorithms (left – Rainbow; right – PPO) to match the score achieved using our SimPLe training method. The red line indicates the number of interactions used by our method. The main promise of model-based reinforcement learning methods is in environments where interactions are either costly, slow or require human labeling, such as many robotics tasks. In such environments, a learned simulator would enable a better understanding of the agent’s environment and could lead to new, better and faster ways for doing multi-task reinforcement learning. While SimPLe does not yet match the performance of standard model-free RL methods, it is substantially more efficient, and we expect future work to further improve the performance of model-based techniques. If you’d like to develop your own models and experiments, head to our repository and colab where you’ll find instructions on how to reproduce our work along with pre-trained world models. – Speaking of forecasts… good read here- what happens if the auto business starts a downward trend? – This week is a big one for events- in New York it’s Glass Expo Northeast and in San Antonio it is the Glass Processing Automation Days (GPAD) event. I will be in Texas for that one… first time attending that event and looking forward to learning and networking there. Whatever insights I can gather that are good for the blog I will share here next week… those of you in Long Island, please let me know the same! – Exciting news for a very popular industry figure and long time friend of mine… Jon Johnson. Jon was named National Sales Manager at Architectural Grills & Sunshades. Congrats my friend! Super company and you will do great there. I am sure I am not alone in looking forward to seeing you at all of the industry events again! – Speaking of new positions, a trio of people at Tristar Glass picked up promotions recently. Tim Rome, Derrick Williams, and Erica Couch all moved up the ladder there and it was good to see. While I don’t know Tim very well- I have always been a huge fan of Derrick’s (I can’t tell you how many people would rave about how great Derrick is when I traveled through Oklahoma over the years) and Erica is a true talent- a very positive force at shows/conferences and in our industry- her approaches and insights will be very appreciated for sure. Congrats to all of you there and to Tim Kelley for making the call. – Glass Magazine review time… the new look really took another strong step this month with the focus of the magazine being “green.” The cover shot was a stunner! The best article and section for me was the “The Green Building Maze” – a very well done walk through what can be a very confusing area. I have to give major kudos to Katy Devlin and Wendy Vardaman on the entire section. There was a ton of intel to be had there and its something that is worth keeping bookmarked for future reference. Also of note this issue had a couple of my favorite recurring writers, Joe Schiavone and Matt Johnson with must read pieces and I enjoyed once again the “Trendhunter” segment- this time with Ryan Park at Sage. Those who know me know I love the dynamic glass space and Ryan did a fine job of laying out the innovation. – Ad of the month was a challenge- especially after last month raised the bar very high… still some wonderful pieces but only one winner this time… the nod goes to Tremco. Great use of a building image that immediately catches the eye and then a big call to action statement in the middle. Both were great hooks to get me to stop and read. Well done to the folks at Tremco that made this one happen! Good story on “Dark mode” and its growth. Personally I do prefer some of my sites in that setting- especially heavy texts ones. You get done hang gliding and someone “special” is there to meet you! Look out!